The internet has opened up a whole new world of choice when it comes to loan options. Consumers are realising the benefits of shopping around on the internet in order to find the best interest rates on their loans. But consumers should also be aware that internet lending is open to abuse, and there are some unscrupulous businesses in cyberspace. 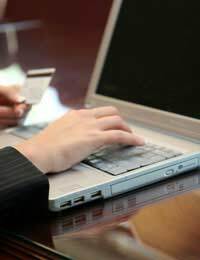 Internet loans are just as they are described; instead of popping down to your local bank branch you simply log onto your computer and fill out a loan application form. But as with all online shopping you do need to look around to get the best deals. Thankfully the internet has made shopping around for loan deals a much easier task. Basically any loan that you can receive from a bank or building society can be found on the internet, usually with better terms and conditions. You can obtain flexible loans, personal loans, unsecured and secured loans, mortgages and business loans. You can also find internet only banks where all banking including loan applications are dealt with online. Loan comparison sites and loan information sites will be able to give advice on the best internet loan options. Loan comparison sites will give the best annual percentage rates for whichever type of loan option you require. Comparison sites will compare numerous lenders in order that the consumer can pick the right lender for their own particular situation. But the borrower should not just use one of the many loan comparison sites. Some of these "unbiased" comparison sites have been known to direct customers to a particular loan or lender. They actually do this for a fee, and the media has made reports of some comparison sites actually being set up by lenders. Borrowers should use more than one comparison site in order to find the most unbiased deal available. The great thing about internet loans is that there is a huge amount of lenders out their vying for the consumer's business. This means that annual percentage rates should begin to drop within this highly competitive marketplace.Of course the annual percentage rate the customer will receive will still be based on the same criteria set by high street lenders. So if you have a poor credit history it will not make too much of a difference if you apply for a loan online or to an actual bank. As internet lenders do have less overheads it not only means that they can charge lower rates of interest but also they may have different fee rules. Many will not charge set up fees for their loans or charge early repayment fees. You will have to look around for these sorts of deals but they are available. Scams are rife on the internet and there are always ways that internet businesses will make money from unwary consumers. A common internet scam is used by so called "loan arrangers". These businesses will target people that have applied for loans online and have been turned down. They will then either inform the customers by post or email that they can find loans for an arrangement fee, usually £50. However, when the fee is paid the loan company will then simply send a list of lenders that offer loans to people with bad credit references. Borrowers with bad credit can find lenders willing to supply them with loans, so paying a fee for others to do so is simply wasting more money. Borrowers should always avoid the temptation to use companies that are not interested in checking their credit references. Companies that claim they will supply internet loans to people with bad credit will always apply extortionate annual percentage rates. These internet loan companies do not differ from the high street lenders that target people with bad credit references. If the borrower can find other lending options then they should look for them. If you apply for a loan online then a credit search will usually be undertaken unless you have refused permission for this. When looking for the right loan simply ask different companies for a quote. By doing this there will be no credit footprints left on your credit report. Too many footprints and it will look like you are either overcommitted or have been continually turned down for loans. There is not doubt that the internet has opened up the lending market not just for normal banks but also to specialised lenders. Care should always be taken when applying for any loans and the borrower should always read all of the loan contract's terms and conditions before signing.